Eureka, CA (May 23, 2018) – After a two-week break, racing returns to Redwood Acres Raceway for a special Sunday afternoon Memorial Day weekend event. 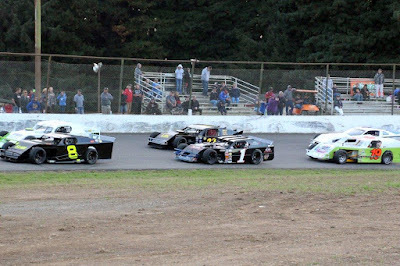 While the Super Six Late Model Challenge series cars are not part of this weekend’s O’Reilly Auto Parts Tribute to the Troops program, the ever-popular North State Modified Series will join the Acres’ regular divisions of roadrunners, Legends, Bandoleros, bombers and mini stocks. Nick and Dylan Ford lead the current standings in the Compass Community Credit Union roadrunners. It will be interesting to see if both will be racing this weekend as the two severely damaged their cars in the second main event on May 12th. Lindsey Zito was the benefactor of that incident and claimed her first win. She sits third in the standings. Patrick Sproul and Amanda Lohr complete the top five. The new Bandolero division has brought new excitement to the 3/8-mile paved oval. Lane Anderson has been a dominate force in the class as he has won all but one race thus far. He holds a 15-point lead over Aiden Kimberling. Kadence Mace is third followed by Maleesa Miles and Donnie Murrell. Former Thunder Roadster racer, Chris Lawrence has made a smooth transition over to the NorthCoast Lighting and Electric Legends division. His lead over his step-son Tyler Peach is 12 points going into this weekend. Brent Mack is five points behind Peach in third with Tyler Krupa and Brad Curtice finish out the top five. Nick Green is the point leader for the Fortuna Wheel & Brake bombers. His advantage in the championship battle is only three points. Ryan Walters holds down second while third place Jim Redd is one point behind Walters in third. Sam Brown sits in fourth with Kolby Jackson fifth. The battle in the Humboldt Hydroponics mini stock class is also a tight one. Eugene Palmer leads Brian Murrell, Jr. by five markers. 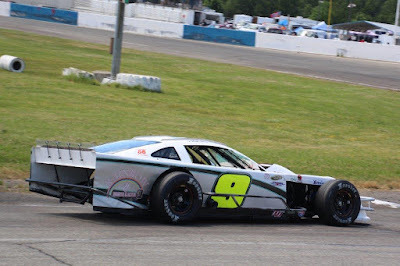 Both drivers had issues in the May 12th race which not only allowed third place Trevor Eacret to close in points but also obtain his first main event win. Veteran Gary Klientobe is a steady fourth in the standings with Jordan Paiment two points behind Kleintobe in fifth. The weekend off for the Mid-City Motor World Super Six Late Model Challenge Series will be a good thing for several drivers. Mic Moulton has won both races in the. He has an 11-point advantage over Dane Nissen. David Henderson lies in third, 13 points in arrears to Moulton. Marty Walsh and Tim Crenshaw both have catching up to do as they are 21 and 31 points behind Moulton. 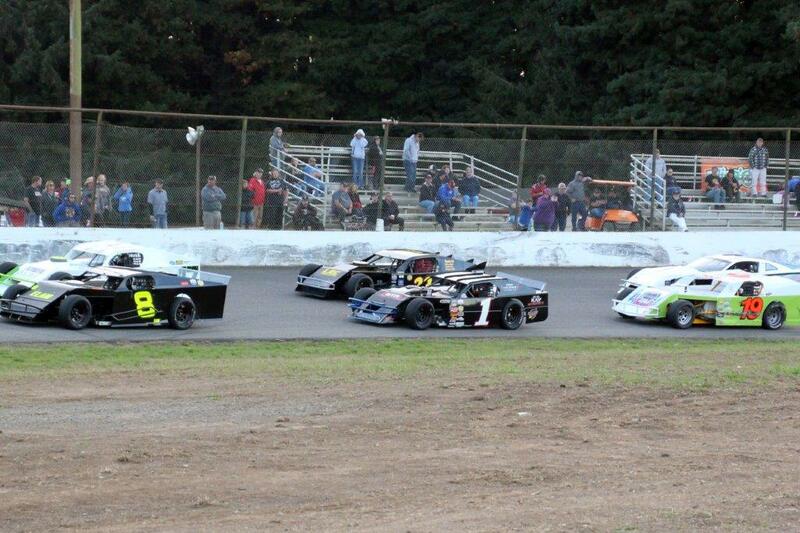 This Sunday will be the first of three times that the North State Modifieds will be racing at Redwood Acres Raceway. Throughout the 2018 season, the series will be featuring the “Driving Out Cancer Tour”, which is bringing awareness to cancer research. The tour was inspired by series’ competitor Rick Avila. 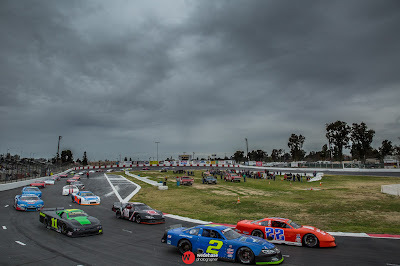 The NSMS opened their season at Shasta Speedway on May 12th with Kris Price winning over Randy Houston, Cameron Austin, Jason Philpot and Dustin Derosier. Houston currently leads the series’ standings by one point over Price. The modifieds raced at Redwood Acres Raceway three times in 2017 with three different drivers taking main event wins; Darrin Sullivan, Randy Houston and Darrin Knight. The North State Modified Series, presented by Protect the Harvest, moves north to Redwood Acres Raceway this Memorial Day weekend for race #2 of the “Driving Out Cancer” awareness tour. The race will be on Sunday night, May 27. A Saturday afternoon practice will be held on the 3/8 mile paved oval from 1pm until 6pm. Redwood Acres Raceway is located on the Redwood Acres Fairgrounds at 3750 Harris Street in Eureka, CA. The O'Reilly Nor-Cal 60 lap feature will pay $1000 to the winner plus a $250 bonus from Ward Land Management and Development (WLM&D.). The Lucas Oil Dash for Cash contenders run for $100 to win and $50 for second place. In addition, the top 15 drivers in the NSMS points standings will share in the $2500 Lucas Oil Tow Money program, and every driver that enters the event gets $100 bonus tow money. The first NSMS tour race was held at Shasta Speedway earlier this month. Kris Price of Sacramento was the winner of the feature, while Darrin Knight of Kelseyville set fast time over the 27 car field. Adrianna Strugnell, Kelseyville, earned the Keyser Hard Charger award by passing the most cars. A new points system finds Randy Houston of Medford, Oregon leading over Kris Price by one point due to his second fast qualifying lap. Santa Rosa's Cameron Austin sits third in points followed by Sacramento's Jason Philpot and Cloverdale driver Dustin DeRosier. 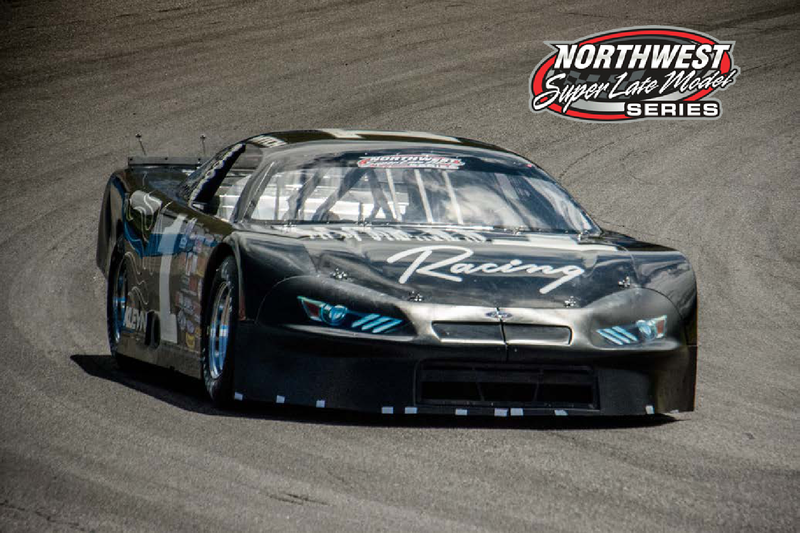 The North State Modified Series will join the local bombers, road runners ,bandoleros, legends cars and mini stocks. For more information visit the North State Modified Series Facebook page or call the NSMS business office at 707-2724-1662. Eureka, CA (May 20, 2018) – After a month’s break, outlaw kart racing returned to the Redwood Acres fairgrounds for the second event of the season. John’s Used Cars and Wreckers sponsored the event which proved to be a brisk and windy day at the 1/10-mile dirt oval but that didn’t prevent the racing on the track to be exciting. Corbin Green took the heat race victory for the Champagne Attorney Service beginner box stocks. Green shot out to the lead of the 20-lap main event. Jack Myer slipped into second past Danica Kinsey. Green pulled out to a several kart-length lead over Myer but as the race progressed, Myer began to slowly close in. Green spun handing the lead over to Myer and causing the race’s only caution flag. Myer led the restart but it didn’t take long for Green to move back to the lead as he moved under and past Myer for the lead in the closing stages. At the finish it was Green winning over Myer, Aaliyah Mitchell and Kinsey. The Williamson Financial box stock heat race was claimed by Derrick Kessler, Jr. The 20-lap main event was brought to the green flag by Brady Osborn and Sonya Osborn. Brady shot out to the early lead but the race was filled with caution flags. The most notable came when Janice Walters lost power down the back stretch. Brady Osbourn tried to avoid Walters while second place Kessler tried to do the same. Both karts collided bringing out a caution but both were able to continue. Sonya Osborn inherited the lead briefly but Grant Williamson was able to quickly take over. Williamson led for a while but Kessler was able to work his way back to the lead in the closing stages. The finish saw Kessler take the victory followed by Sonya Osborn, Walters, Brady Osborn and Williamson. In the Wes Green Landscaping 125/550cc heat race, Chelsea Champagne was the victor. The main event was dominated flag-to-flag by Landen Green. His closest competitor was Champagne who tried everything she could to apply pressure Green to make a mistake. Unfortunately for her, that mistake never came. Green was able to take the win over Champagne, Wyatt Burns, Malessa Miles and Mkinzy Uselton. Michlette Family Racing stepped up to sponsor the pure stock division. Michael Lawrence was the winner of the heat race. The main event proved to be a playing ground for Jordan Michlette as he was able to take the lead after a caution slowed the field. A late caution bunched the field and allowed Lawrence to close in. However, Michlette was able to pull out to a sizable lead and the race win. Lawrence placed second while Curtis Lyon. The NorCal Automotive 500cc/open karts were in action. It proved to be Tony Miles’ day as he was able to win the heat race and dominate the feature event. Dax Williamson placed second. Wenatchee, WA (May 21, 2018) When the Northwest Super Late Model Series Inc. (NWSLMS) makes its second official start at South Sound Speedway (SSS) on June 2nd, Mitch Kleyn (Quincy, WA) is hoping to be first to the checkered flag at the 3/8th mile oval for a repeat of last year’s victory. Kleyn and crew chief, Travis Sharpe put the Wild 1 Racing, Thaemert Farms, and 12 Hawks Chevrolet across the stripe in the lead to win his first Super Late Model event at the 2017 outing. Coming from a racing family, Kleyn remembers his father taking his brothers and him to Ephrata Speedway in the 70’s and 80’s to the races. There he watched Christian Roeder race and win many times. Despite their father’s warning to never race, Mitch and both of his brothers have all been behind the wheel. When asked what he does when he’s not racing, Kleyn says he didn’t understand the question. He then laughed and noted that he’s always racing. A tight knit family, Kleyn is Kasey and daughter Brooke’s chauffeur during the week for school and afterschool sports. However, Rhonda Kleyn makes it all happen according to her husband, from keeping the troops fed and the cars vinyl looking pristine. SAN BERNARDINO, Calif. — He came, he saw, he conquered, he avenged. Ryan Partridge, flexed his muscle, figuratively and literally, and dominated en route to the Sunrise Ford 150 victory on Saturday evening at Orange Show Speedway, his fifth NASCAR K&N Pro Series West victory of his career and first this season. He also avenged his frustrating 2016 loss at this track, where he led 137 laps from the pole to see a sure win fall out of his hands due to a mishap with a lapped car down the stretch. This time, he made sure he’d claim his checkered flag. Starting from the pole, the Rancho Cucamonga, California, native led the first 37 circuits before Derek Kraus was able to take the top spot away as the caution flag flew. Shortly thereafter, Partridge re-took the lead and never looked back, leading all the way to the finish. 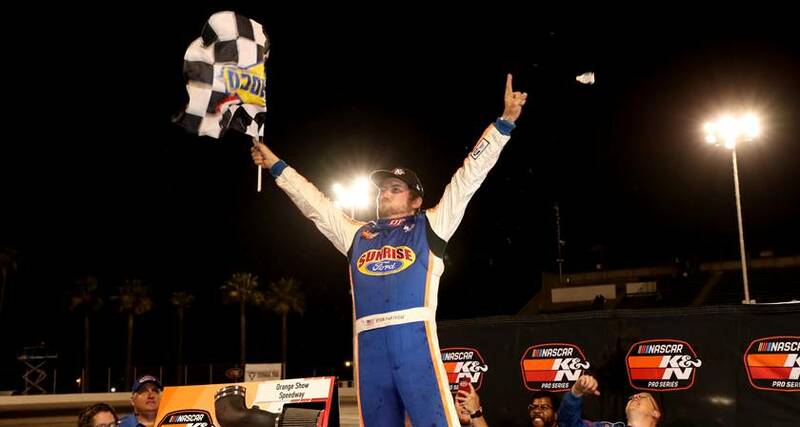 Having finishes of fifth (Kern County), third (Tucson) and second (Tucson), it was only a matter of time before the 2016 series runners-up would find Victory Lane. His Sunrise Ford teammate and championship points leader entering Orange Show, Thorn, was able to get by Kraus with 24 laps to go. The Lakeport, California native and 2013 series champion tried to put the pressure on Partridge, but couldn’t seal the deal. Orange Show marks Thorn’s third second-place result this season (Kern County and Tucson race No. 2). But despite the solid runs, he’s getting a bit impatient and frustrated with not breaking through. Cole Rouse tied his season-best finish of third when the checkered flag flew, but admitted he wanted more. Rouse’s Bill McAnally Racing teammates and newly minted NASCAR Next drivers Hailie Deegan (career-best finish) and Derek Kraus rounded out the top five. Trevor Huddleston, Kody Vanderwal, Todd Souza, Nick Joanides and Matt Levin completed the top 10. Partridge now leads Thorn by three points and Kraus by 10, while Rouse (-12) and Vanderwal (-17) round out the top five. 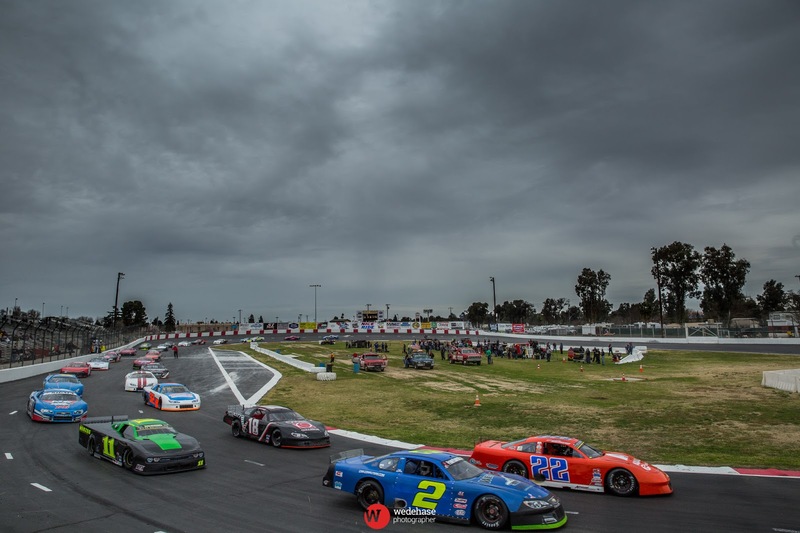 The NASCAR K&N Pro Series West will take one week off before heading to Colorado National Speedway in Dacono, Colorado, for the NAPA/Toyota 150 on Saturday, June 9. The Sunrise Ford 150 will air on NBCSN on Thursday, May 24 at 6 p.m. ET. 1. (1) Ryan Partridge, Rancho Cucamonga, Calif., Ford, 150 laps, 52.468 mph. 2. (5) Derek Thorn, Lakeport, CA, Ford, 150. 3. (3) Cole Rouse, Fort Smith, Ark., Toyota, 150. 4. (4) Hailie Deegan, Temecula, CA, Toyota, 150. 5. (2) Derek Kraus, Stratford, Wis., Toyota, 150. 6. (8) Trevor Huddleston, Agoura Hills, Calif., Ford, 150. 7. (7) Kody Vanderwal, LaSalle, Colo, Ford, 150. 8. (6) Todd Souza, Aromas, Calif., Toyota, 150. 9. (11) Nick Joanides, Woodland Hills, CA, Toyota, 150. 10. (9) Matt Levin, Tucson, Ariz., Chevrolet, 149. 11. (12) Will Rodgers, Solvang, Calif., Ford, 149. 12. (13) Takuma Koga, Nagoya, Japan, Chevrolet, 148. 13. (14) Bill Kann, Scottsdale, Ariz., Chevrolet, 148. 14. (16) Jesse Iwuji, Carrolton, Texas, Chevrolet, 144. 15. (15) Rich DeLong III, Santa Clarita, Calif., Chevrolet, 143. 16. (10) Zachary St. Onge, Upland, CA, Chevrolet, 142. Caution Flags: 5 for 27 laps. Lead Changes: 6 among 2 drivers. Lap Leaders: R. Partridge 1-36; D. Kraus 37; R. Partridge 38; D. Kraus 39-58; R. Partridge 59-116; D. Kraus 117; R. Partridge 118-150. Standings: 1. R. Partridge, 172; 2. D. Thorn, 169; 3. D. Kraus, 162; 4. C. Rouse, 160; 5. K. Vanderwal, 155; 6. H. Deegan, 149; 7. T. Huddleston, 148; 8. W. Rodgers, 133; 9. M. Levin, 131; 10. T. Souza, 122. 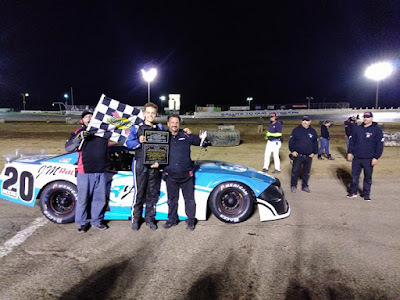 UKIAH, CALIFORNIA (May 20, 2018) – Cole Moore led 72 laps and put together a masterful set of final restarts to prevail at Ukiah Speedway on Saturday night, charging to his second career Pacific Challenge Series presented by PenneyLawyers.com victory. Moore conquered the challenging quarter-mile bullring in a race that was a tale of two acts. Shasta Raceway Park winner Jason Romero won the Sunoco Fuels Fast Time Award for the second consecutive race, but had work to do when the field was fully inverted for the American Racer Tire Dash. Romero finished seventh to start seventh in the feature while Coquille, OR’s David Miller won the Dash for a set of tires and the pole position of the feature with Moore finishing second for the outside front row. Moore used his outside starting position to challenge Miller from the outside from the drop of the green flag, taking the lead on lap three. Defending series champion Mike Beeler used the outside line to move forward and brought Romero with him, with the duo advancing to second and third respectively by lap 11. Ukiah’s John Dalerio started tenth and immediately moved to the front, passing a quickly faltering Miller for fifth on lap 16. Romero aimed high and low on Beeler in an entertaining race for second place while Miller anchored a four car line of cars from sixth through ninth positions. Romero took over second on lap 29 but had a half-lap deficit to make up on Cole Moore by that point. Moore started lapping cars, lapping fellow front row starter Miller on lap 35. Redwood Valley’s Kolby Berry used the leader as a pick to advance up into sixth position but was also put down a lap a few laps later. Matt Wendt struggled with rear end issues and was tagged by race leader Cole Moore on lap 59, with Wendt limping to a stop in the infield for the first caution of the race. Wendt surrendered to the pits as had Miller by that point. Both did not return. Romero seized the chance to challenge Moore for the lead after a 59 lap green flag run. After pacing behind Moore for several laps after the restart, Romero gave him a pair of taps into turn three to grab the lead at lap 66. Romero missed his marks into turn one, sailing up the hill and off the edge of the track in turn two. He slid into the dirt to surrender the lead and force a caution flag. Moore reassumed the lead while Romero tried to mount a comeback from the rear of the pack with just nine laps remaining. John Moore tangled with John Dalerio twice, first on lap 70 and again on lap 73. Both restarts saw Cole Moore pick the inside line against Mike Beeler and both attempts saw Moore drive away in convincing fashion. The final two lap shootout was a mad scramble, with Berry diving inside the pack down the backstretch to nearly show his nose to race leader Cole Moore. He ended up sliding in front of Beeler for second with one to go. Cole Moore took a five car length victory while Romero crossed over Berry at the line to take a narrow second place finish. Beeler ended up relegated to fourth with John Moore just a few feet behind in fifth as well. Berry’s drive from ninth to third earned him the Penney Racing Supply Hard Charger Award. The evening began with a tribute to Martin Disomma, the father of PCS official Blake Disomma. $100 was added to the winner’s purse for each division racing at Ukiah on Saturday, making Cole Moore’s win a $1600 victory. 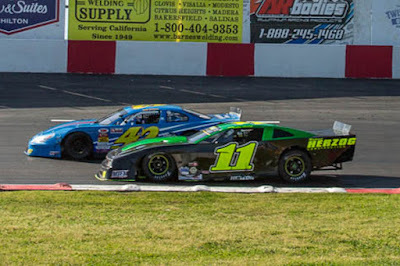 The Pacific Challenge Series presented by PenneyLawyers.com makes its second stop at Shasta Speedway on June 23rd as part of the Shasta District Fair for its fourth race of 2018!